ROCHESTER, N.Y. -- More hard-hitting than a tombstone pile driver delivered by The Undertaker...more entertaining than Chris Jericho geting over a pen and a clipboard as a gimmick...filled with as much drama as the Bret Hart-Shawn Michaels Iron Man Match...it's the Red Wings' first ever Salute to Pro Wrestling Night Wednesday, August 22. The event is presented by Airport Transmission and Cricket Wireless. 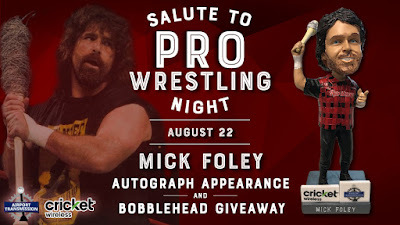 * a special appearance by WWE Hall of Famer and New York Times best-selling author Mick Foley - who will sign autographs and take pictures with fans, and take part in a Pre-Game Live interview sure to be as entertaining and emotional than Mankind's "This Is Your Life" tribute to The Rock. Foley will sign autographs for fans in the concourse near the Red Wings Hall of Fame from 6 pm until 6:40 pm. He will throw out the first pitch, then sign for fans again from 7:05 until 8 pm. * fans are encouraged to dress as their favorite pro wrestler (PG era, please) for the chance to be part of special wrestling-themed on-field promotions including the Finger Poke of Doom, a two out of three falls thumb wrestling match with Foley, Name That Ring Entrance Tune, Paul Heyman Promo showdown, proof reading old Wrestling Observer newsletters to see who can find the most grammar and syntax errors (magnifying glasses provided), and more. It's true, it's true - pro wrestling takes over Frontier Field August 22. Smart marks stay home - the whole night will be kayfabe. Don't be one of those jabronis who waits to read about it later in the dirt sheets; order your tickets today for the greatest promotion night the baseball and wrestling worlds have ever seen. 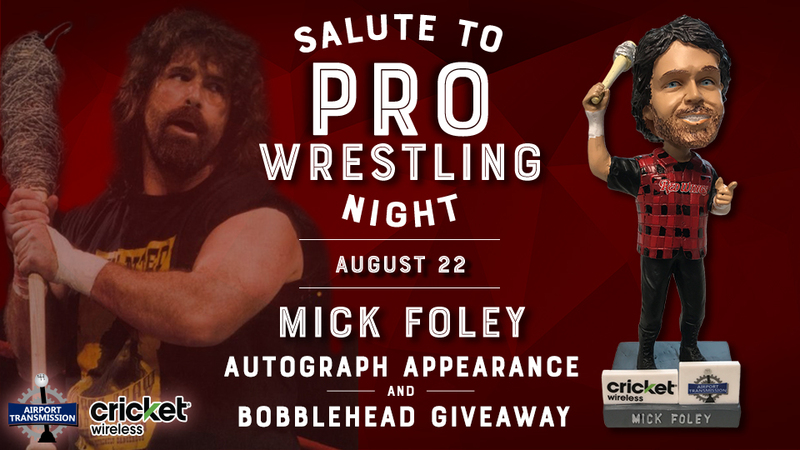 Salute to Pro Wrestling Night August 22....as the great Freddie Miller would say, "Don't miss it - beeee there."